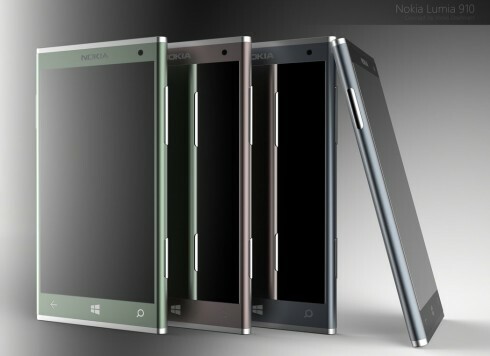 Jonas Daehnert, the designer who created the beautiful Surface Phone is now back with a Nokia Lumia 910 teaser. This phone has remarkable finesse, a metallic case and an interesting choice of colours, that makes me think about autumn. Also, the device is less rounded than previous Lumias and much thinner. Nokia Lumia 910 features a 4.3 inch screen without the black screen frame and it’s very, very thin at 6.8mm in waistline. The handset is very compact and its body is made of aluminum. Jonas didn’t detail other specs, since frankly they don’t matter. Windows Phone 8 Apollo runs on multicore CPUs and that’s all you need to know. Pureview is seen by the designer as a good technology, but one that makes the phone ugly. As I said, the finesse of the phone is great and I like the bigger camera button, as opposed to the smaller camera key that we also saw on the Nokia Pureview 808 handset. I suppose the smartphone has a soft touch area at the bottom, with those Windows Phone keys, that are most likely touch only. So, do you dig this model?